Mobile users who are uncontrollably glued to their smartphones can now take a more analytic approach to quitting by using a new app: BreakFree. 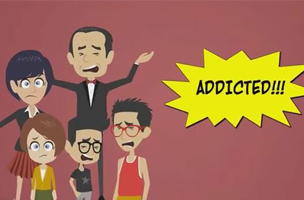 The app aims to help users break free from their smartphone addiction by supplying usage data. Even without a smartphone addiction, the data usage is bound to look disturbingly wasteful since the average adult is checking in on a smartphone 110 times every day. That’s once every 13 minutes of life. According to recent analytics from Flurry, approximately 176 million mobile addicts exist worldwide. That’s 176 million users who launch apps more than 60 times each day. Since its creation and launch in February 2014, BreakFree has been downloaded by at least 15,000 addicts at least 200,000 times to monitor smartphone usage. The app is great for users who want to start limiting their hours on particularly non-productive, time-sucking social apps like Facebook or Pinterest. Usage Monitoring: The app studies your phone usage pattern in the background and warns you with timely notifications whenever you go overboard. E.g. if you are using a particular app for long, if you are making too many calls or if you have used the phone for over an hour, BreakFree will notify you to slow down. Non Intrusive notifications: Using a highly advanced algorithm, the app calculates an addiction score in real time and maintains a detailed history of your scores. The app communicates results through a friendly and engaging character called Sato (You’ll love this guy :). Phone Management Tools: The app also provides you phone management tools such as disabling the internet, rejecting phone calls and sending auto text messages. You can completely control your habits by scheduling these tools to run on a given day at a given time. For instance, say you want to spend family time every Sunday from 3 PM to 6 PM, schedule your phone to disable sound and internet so that you are not disturbed by calls and notifications during that time. Usage Statistics: View usage stats for your top used apps, call patterns and other functions to help you make informed decisions on taking necessary actions. E.g., If you know you’ve launched WhatsApp 30 times in a day, then it’s time to take a step back and cut down on that. Parental Control: For the younger smartphone users, BreakFree can be used as a great parental control device. By installing it on your child’s smartphone you can monitor his / her phone usage, schedule internet hours, etc.